Deborah Silver & Co. is a firm offering landscape and garden design. Founded in 1986 by Deborah Silver, our award-winning company provides a wide range of design and installation services for its clients. Deborah Silver & Co. is the original member of a group of three companies owned by Deborah Silver, landscape designer, which together provide a complete range of products and services for homes, gardens and landscapes. Detroit Garden Works, established in 1995, is considered one of the top garden stores in America. Branch, a studio dedicated to the design and fabrication of garden ornament, was founded in 2004. We provide consultation regarding the selection of containers, garden furnishings, ornament or sculpture. This service is available both in house and on site. We design and plant containers appropriate to every season of the gardening year. We coach those gardeners who prefer to do the work themselves in plant selection, plant combinations and proper care. We provide a full range of garden and landscape design services-from a sketch to construction grade blueprints. We provide expert landscape and garden installation. We are able to renovate existing landscapes and gardens, or create a new landscape from start to finish. 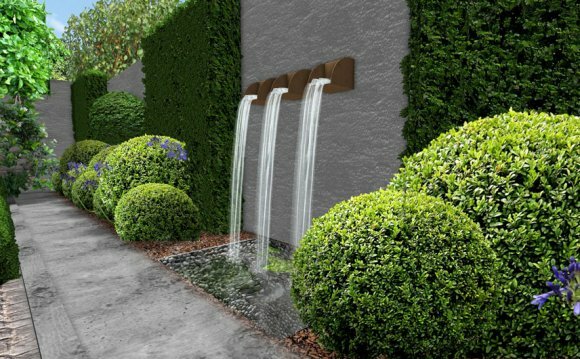 We design and manufacture custom finished pots, boxes, pergolas, arbors, fountains to specification in steel. We offer the full range of garden maintenance services, including proper pruning. We maintain a roster of landscape and garden service companies we like and recommend, from lawn and tree care, garden maintenance, lighting, irrigation, large tree planting, drainage work, brick, masonry and stonework, to pool and fountain construction and maintenance. We provide cut flowers for parties, gifts and events. We design and install winter pot plantings, holiday lighting, and décor. We custom make topiary sculpture with natural materials for the home.